Britain’s Longest Reigning Monarch Queen Elizabeth. 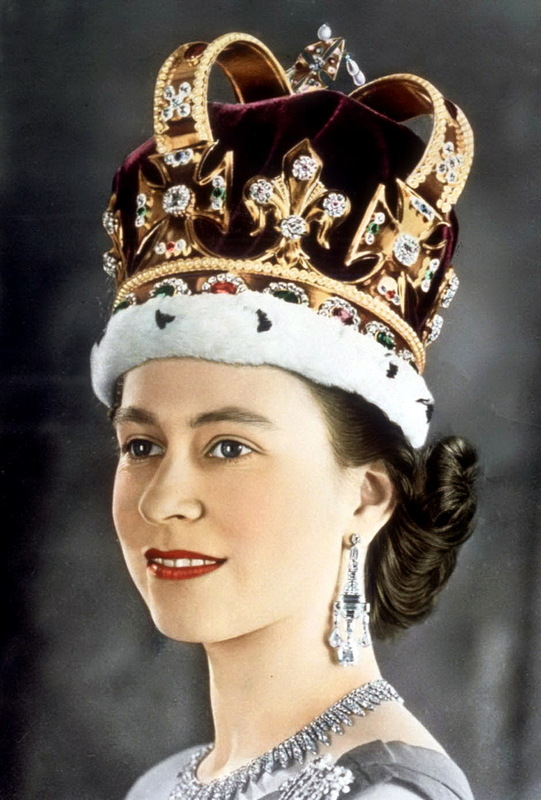 This Wednesday on September 9, 2015, Queen Elizabeth will become Britain’s longest reigning monarch. She will surpass the record held by her great-great-grandmother, Queen Victoria, who reigned 63 years, 7 months and 3 days. It is interesting to consider that like Queen Elizabeth when Princess Alexandrina Victoria of Kent was born she was not the daughter of the first son in line to the throne. Queen Victoria’s father, Prince Edward Augustus, Duke of Kent and Strathearn, was the fourth son of King George III. 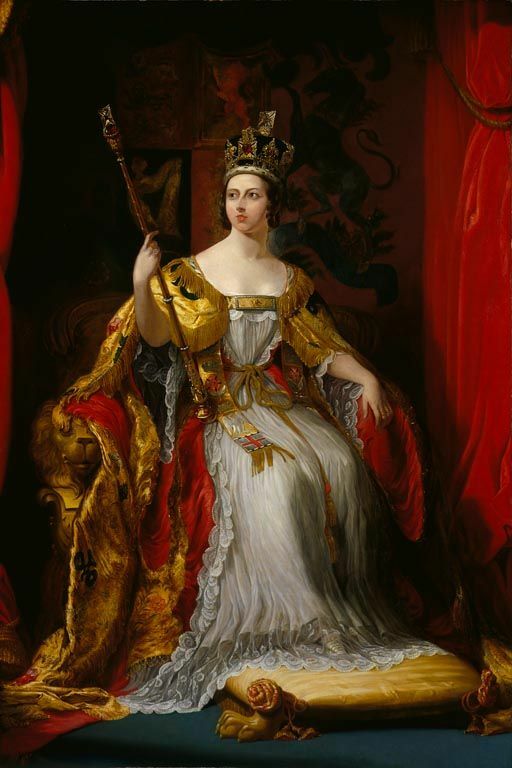 She came to the throne at age 18 in 1838 after the death of her uncle King William IV. She ruled until her death, at age 81, in 1901. “Queen Victoria” by Franz Xaver Winterhalter, 1845. When Princess Elizabeth Alexandra Mary Windsor was born on April 21, 1926, she was not expected to become monarch. She was the first child of Prince Albert and his wife, Elizabeth. Her father, the Duke of York, was second in line to the throne. It was expected that Prince Edward, Albert’s older brother, would marry and have children. However, King Edward VIII abdicated the throne in 1936 so that he could be with the woman he loved, divorcée Wallis Simpson. Princess Elizabeth was ten years of age when her father, Prince Albert, ascended to the throne as George VI. Princess Elizabeth then became the heiress presumptive. Princess Elizabeth was schooled at home along with her sister, Princess Margaret. She was exposed to art and music, learned to ride and is fluent in French. She was an excellent swimmer and became a Girl Guide (Girl Scout) at the age of eleven. After her father became king she began to study constitutional history and law in preparation for her future role as queen. As future head of the Church of England, she also received instruction in religion by the Archbishop of Canterbury. During World War II, the princess joined the Women’s Auxiliary Territorial Service at the rank of the second subaltern and did her wartime duty as a driver and mechanic. Upon the death of her father in 1952, at the age of twenty-five, she became head of the commonwealth. Here the Queen is shown wearing St Edward’s Crown which was created in 1661. It is traditionally placed on the head of the monarch at the end of the coronation ceremony. Also shown are the Greville Chandelier Earrings and City of London Fringe Necklace. 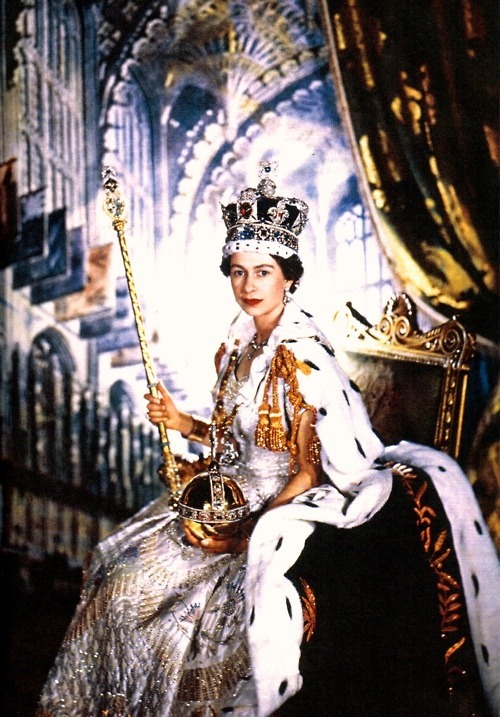 For her official coronation portrait, taken by Sir Cecil Beaton, the Queen wore the Imperial Crown which features some of the most famous stones in the world. They include the Black Prince’s Ruby, the Second Star of Africa diamond and the pearls suspended along the arches are thought to have come from a pair of earrings that once belonged to Queen Elizabeth I. During her 63 year reign, the Queen has worked with 12 British Prime Ministers. The first was Sir Winston Churchill. Winston Churchill and his daughter, Mary Spencer Churchill, in London, c. 1943. The United States has had a total of twelve presidents during the Queen’s reign. When she began Harry S. Truman was president. Lyndon B. Johnson was the only President not to meet with the Queen. Through it all, she has maintained an almost 68-year marriage. The Queen and the Duke of Edinburgh were married on November 20, 1947. The Queen first met Prince Philip in 1934. At a later meeting, when she was just thirteen, she has said that she fell head over heels in love with him. Prince Philip has accompanied the Queen on every single one of her Commonwealth tours and state visits. During the coronation tour of the commonwealth from November 1953 to May 1954, they traveled a whopping total of 43,618 miles. Their relationship still seems to not have lost its sparkle. Here the Queen is seen giggling at Prince Philip bedecked in full regalia of the 25th Colonel Grenadier Guards, in Guard Of Honour Order during a Trooping The Colour. In addition to ruling the commonwealth, she has had four children all at home. Here she is seen in bed after the birth of Prince Edward in 1964. They are surrounded by her other children Prince Charles of Wales, 15, Prince Andrew, 4, and Princess Royal, Anne, 13. It could not have been easy to leave her children behind as she was so often expected to do. 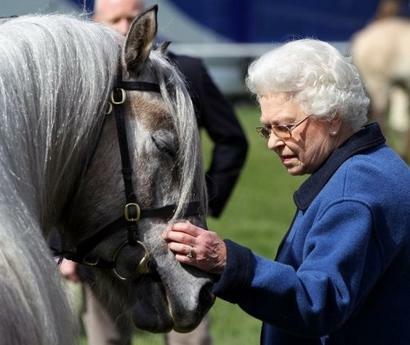 Queen Elizabeth is said to have a wonderful sense of humor and is well known for her kindness to animals. She is most often shown with her Pembroke Welsh Corgis. But she also raises labradors and of course dachshunds. I shall close with some of my favorite official images of the Queen. Here she is shown wearing the Diamond Diadem, originally created in 1821 for King George IV. Her necklace is known as the Nizam of Hyderabad. The earrings are her Bahrain Pearl Drops. This crown is a favorite of the Queen’s. It features roses, thistles and shamrocks – the symbols of England, Scotland and Ireland. I love this photo of the Queen wearing Queen Mary’s Vladimir tiara, Delhi Durbar earrings, the Cullinan V pendant necklace and one of Queen Victoria’s bow brooches on her sash. 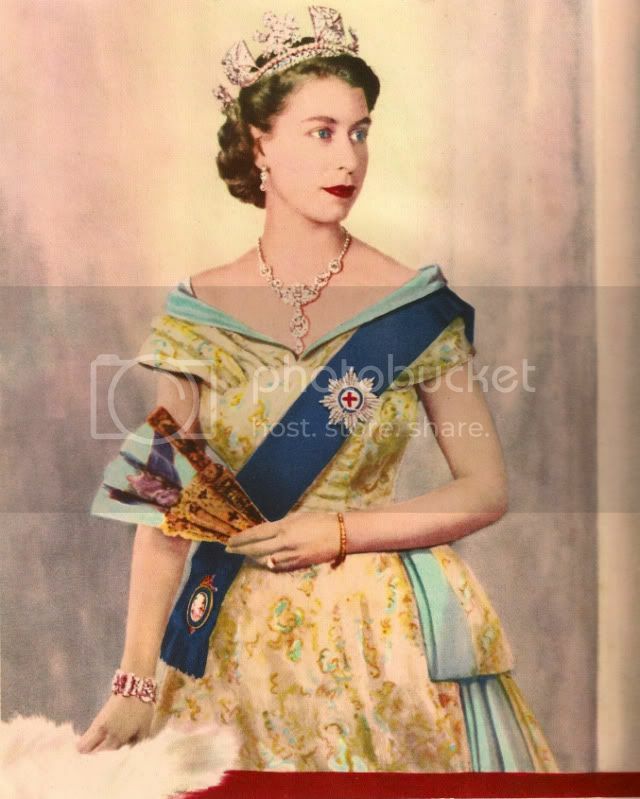 Here the Queen is wearing the Girls of Great Britain and Ireland tiara, Queen Victoria’s pearl earrings (given to her by Prince Albert on the occasion of their weddings) and at the lower end of the sash the Order of the Garter. What a wonderful tribute to Queen Elizabeth! I remember we actually got out of school so we could watch her coronation at home on television! That was a LONG time ago – ha! The reason I remember it so well is that my father had resisted buying a tv but when he heard we were the only kids in our school who had to go to someone else's house to watch the coronation he finally broke down and bought a set. Before that he had always said he'd wait until they got it in color – thinking THAT would never happen! He still joked about our being the only kids without a tv well into his nineties. Fun memories! Laura, this is a beautiful photo essay, better than all the 'professional' ones that will be popping up in the next couple of days. The pic of her in front of the window with a book is one that I've never seen before. Well done to you, and to her – still working at 89! I hear she writes in her diary every night – I won't live long enough to read it, but I envy future historians who will. I ADORE these ROYAL posts, Laura. They're re-reads x 18, indeed! P.S. Hearty and hardy congratulations to Britain's longest-reigning queen! Long live the Queen! I wonder if they'll shoot off the cannons for her on Wednesday. Thanks for putting this lovely post together. Such an interesting post. Love seeing the fabulous photos. Many of these I have not seen, so I do appreciate reading this post. Such an interesting post, Laura! I watched a program on PBS last night about the queen and found it so fascinating. What an interesting life she has led. And what a stunning beauty she was back in the day! Great post, I love all the trivia you always share, so interesting. Can't wait to see your tour tomorrow. So interesting, Laura! I can't imagine being born into that and really having no say of your life. such an interesting post.. i loved looking at all the old pictures. What a fascinating life she has led! Thanks for posting. Great pictures too! And look at that beautiful jewelry! Une très intéressante publication qui complète magnifiquement bien ce que je connaissais de la vie de la reine Elisabeth. Un petit billet agrémenté de merveilleuses photos. A beautiful photo essay. I can just imagine the time it took you to put this together – thank you! There are pictures in your post I had never seen before! I loved this post, Laura!! These are great pictures, and I learned some new things. I knew the Queen loved her Welsh Corgis, but I didn't know she also has labs and dachshunds. How neat! 🙂 She has certainly led quite an amazing life. Long live the Queen!